Chipmaker Intel's global investment arm Intel Capital has announced an investment of $20 million in six Indian companies. Three of these investments â€“ Saankhya Labs, Testing Czars and FINO â€“ have been completed while investment agreements have been signed with What's On India, enStage and DURON Energy . This is the second announcement this year by the investment arm. In May, Intel Capital India announced an $18 million investment in online travel company Yatra Online Pvt Ltd, mobile VAS company July Systems, online insurance retailer PolicyBazaar, healthcare tech company Sudhir Srivastava Robotics Surgery Center Pvt Ltd and a Colombo and California-based open source software company WSO2. Intel Capital has said that 80 per cent of the $250 million Intel Capital India Technology Fund, set up in 2005, has been deployed across 40 companies. Last year, the fund invested $45 million while this year, it has invested $39 million so far. The focus areas for investment include data centres, Cloud technology, education, smart TV & mobility, software & services and consumer Internet. The average deal size for Intel Capital India is around $4 million per company and it acquires 20 per cent ownership. The fund has made only one exit this year â€“ from Hyderabad-based Hellosoft that offers VoIP and wireless LAN solutions. It has been acquired by British firm Imagination Technologies earlier this year for $47 million. Intel Capital expects Multi Commodity Exchange (MCX) to be its second exit, via an IPO, by the year-end. "Venture capitalists have a lot of opportunities in India. We have also seen a lot of activities here but few high quality deals. However, Intel Capital will be going soft on exits in 2012, given the economic climate," said Sudheer Kuppam, managing director (Asia-Pacific) of Intel Capital. When the current fund is exhausted, Intel Capital will announce a successive fund for India, he added. Other portfolio companies of Intel Capital India include Noida-based Wortal Technologies that runs local events portal BuzzInTown, Pune-based Persistent Systems, Infrasoft Technologies, KLG Systel, online travel agency Yatra Online, mobile VAS firm July Systems, online insurance retailer PolicyBazaar and healthcare technology firm Sudhir Srivastava Robotics Surgery Center Pvt Ltd.
Globally, Intel has announced a $300 million Ultrabook Fund for its new, lightweight laptop range. Ultrabook Fund will invest in start-ups developing hardware and software around user experience, storage, battery life and slim component and platforms for the new category of devices called Ultrabooks, developed by Intel. In 2010, Intel Capital had invested $327 million across 119 companies. Smart TV and mobility have become a focus area for Intel recently, with the firm announcing a partnership with Google to adopt Android OS into Intel chips. The investments into Saankhya Labs, What's On India and TestingCzars are in line with this new focus for the company. 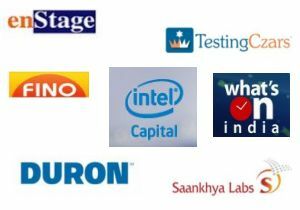 Both Saankhya Labs and TestingCzars are technology firms with unique products developed entirely in India. Set up in 2007, Saankhya is a Bangalore-based fabless semiconductor company that has developed a software-defined radio app which can be used in all televisions (and not just Smart TVs) for improved functionality. This is the first semiconductor product company that the chipmaker's investment arm has backed in India. "It will facilitate the portability of Android OS onto the semiconductor architecture," explained Kuppam. The software developed by What's On India can also be integrated with Intel's development in this space. "Intel is betting on the Smart TV segment, as part of our digital home market focus which we showcased at CES 2011. As we roll out more solutions, it will be a natural way to plug in technologies such as What's on India's into them," said Pradeep Tagare, Director, Intel Capital India. Nexus Venture Partners and Sequoia Capital also participated in the funding round for What's On India. The company is on track to meet its target of reaching 40 million homes with its electronic television programme guides by December 2011. It has launched apps on Android OS and Nokia Ovi store. Currently, it is readying apps for iPad, iPhone and BlackBerry handsets, according to the CEO, Atul Phadnis. The investment will be used to expand the firm's media portfolio and expand into new technologies. Intel's interest in the mobile ecosystem is also seen in its investment in TestingCzars that offers code-free testing of software and applications. There is a plethora of software testing services firms in the country, but not many with an automated solution that is code-free, according to Anupam Srivastava, director, Intel Capital. He felt that a comprehensive approach to software testing would be required, even as the sector faces high attrition rate, as well as lack of talent. Using TestingCzars' solution Verifaya, companies can actually hire untrained employees for testing software and mobile applications. Financial Inclusion Network and Operations (FINO) had also raised funding from Intel Capital earlier this year. And the funding round was completed before Blackstone Ventures invested Rs 150 crore in July 2011. FINO enables micro-transaction sourcing and acquisition through 15,000 transaction points and has 40 million registered users for UID, adding them at a rate of two million per month. EnStage had raised its angel round of funding from Accel Partners and Accel participated in the current round of funding as well. The payment solutions and processing firm currently targets the e-commerce and m-commerce retailers for its 'Verified By VISA' service and reportedly authenticated over $2 billion transactions last year. With operations in India, Sri Lanka, the Middle East and the South-East Asia, enStage plans to use the funds to expand further in the USA as it has become a key target market, Govind Setlur, CEO of enStage, Inc. told Techcircle.in. DURON Energy Pvt Ltd, which manufactures solar power products such as panels and solar UPS, has already completed 12,000 deployments. It is currently participating in the government's Department of Post Vision 2012 project, aimed at computerising 1.3 lakh post offices across India by using netbooks and handhelds. The company has also participated in technology trials in Rajasthan, its president and CEO Ajay Awasthi told Techcircle.in. DURON's solar products will be used to power the netbooks and handsets in the event of electricity outage. Intel believes that DURON's expertise in the government sector will be useful for further expansion in this space.